Just in case your Thanksgiving menu still isn't finalized—or you've suddenly remembered that you're going to have to feed people throughout the weekend and not just on Thursday afternoon—I thought I'd offer up a couple of easy perennial favorites from the archives. 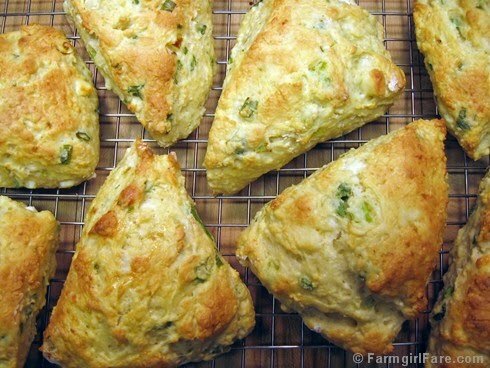 These Savory Cheese and Scallion Scones are always a hit, and because there's no butter to cut in (they're made with softened cream cheese instead), they mix up in no time flat. Serve them warm with dinner instead of rolls or bread, or turn them into scrumptious little leftover turkey sandwiches. They freeze and reheat beautifully, so you can even make them ahead of time. Not a feta fan? Try cheddar and chive instead, with or without a sprinkling of dill. These Spicy Pumpkin Pecan Raisin Muffins were a bestseller at my little bakery cafe in Northern California and continue to delight all these years later. They move easily from breakfast table to afternoon snack plate to holiday dinner bread basket, and the recipe makes 18 large muffins which also freeze beautifully. Perfect to have on hand if you'll be feeding a crowd during the next month. So what are you doing for Thanksgiving? Any baking involved? © Copyright 2009 FarmgirlFare.com, the oven's on foodie farm blog where we aren't actually doing Thanksgiving on Thanksgiving this year, but we eat so well here on the farm that nearly every day is a feast—and for that we are extremely thankful. Thanks for this recipe. I'll be making it for family staying at our house over the weekend. I think these will be a perfect compliment to the Chicken and Vegetable soup that I plan on making! I also pulled a couple of other recipes to try for the weekend; the Beer Bread and the Ginger and Pear Muffins. Thanks for the inspiration! Hi Susan. These scones look wonderful..I do believe I will give these a try tomorrow. My mouth is watering..i so love scones. Oh Geez, these look just delicious! I can't wait to try them. I made those scones recently for a baby shower and they were a hit! Yes! The following days definitely involve baking. I'm going to be trying out a new to me apple pie recipe this year. Chai Spice Apple Pie. In addition to the traditional cinnamon, the pie also had cardamom, clove and fennel seeds. Twist on a classic, we'll see how it comes out! Okay, I want a scone right now. Fax one over, I have to work. We will be baking pies, Southern Cornbread stuffing, Green Bean Casserole, and our first farm raised 31# turkey. Anyone want leftovers. They will be going home with kids. Have a wonderful Thanksgiving. Mmm... savory scones sound wonderful. I haven't made scones in ages. Might have to change that. I'm going to be a baking fool. Cranberry-Walnut rolls, basic white bread rolls, pumpkin pie brioche sticky buns, sweet potato casserole, and a birthday cake. We're celebrating my oldest niece's b-day on T-giving and she requested that I make her cake. Aww. oh my gosh, those scones look so good, I am going to HAVE to make them!! Thank you!! :D Happy Thanksgiving!! You always have The Best Recipes!!! I was in the market yesterday and the marketman was putting out...Brussels Sprouts...and they are gorgeous! No excuse not to try your recipe, and now I must try this scone recipe. Oh my! Wow those scones sound tasty!! I'm gonna try them this weekend, too much already waiting for the oven tomorrow. *G* I'm doing a crockpot broccoli-rice casserole, turkey and cornbread dressing and a sweet potato-pineapple casserole(based on a pie recipe a friend gave me). & farm ...i cried for you & your baby donkey! i have had lambs die on me so i know. 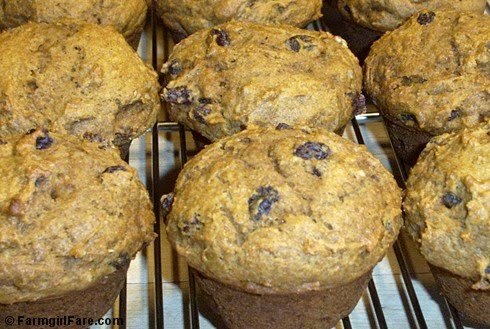 The Spicy pumpkin muffins are a huge favorite around here and every once in a while, I take them to my spinner guild where they are a real hit! Happy Thanksgiving to you and all your critters from the PNW. Take care. T.